It’s true. You know it and I know it. Caramel makes everything (ok really just sweets) better. I would say everything in general, but I am not sure I want my next hamburger to have caramel sauce on it. Because it makes everything (again, read sweets) better, you might have been missing it. 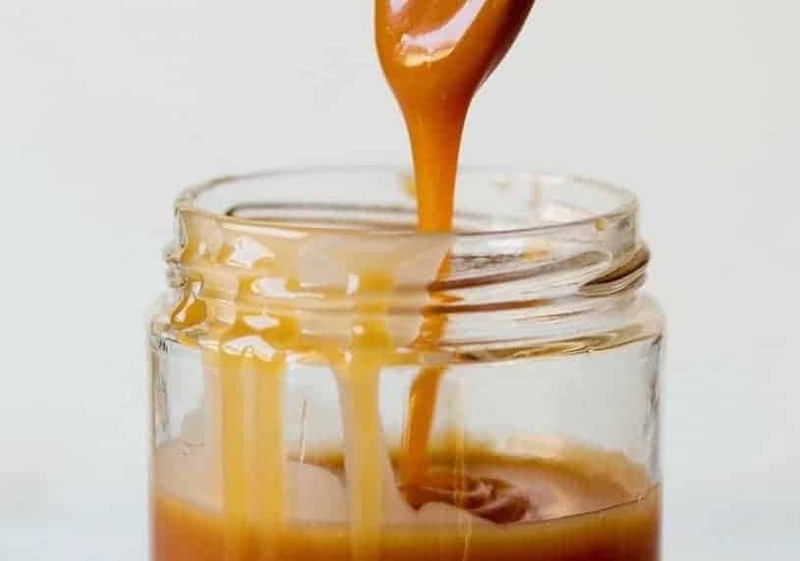 Consequently, the good news is, caramel (or is it carmel) was super easy to make back in your sugar eating days. It’s a really simple mixture that needs only a handful of ingredients; sugar, butter, and cream. Heat it, mix it, and there you go. Luckily, our favorite sweetener Lakanto Golden melts just like regular sugar which makes this recipe possible. It is worth noting that as this mixture cools, the sweetener will begin to return (only somewhat) to its crystalline form. At the same time, the butter will begin to get harder. Therefore, I say all of that to say… Don’t be alarmed if and when this happens! Even with the regular sugar version, this hardening is normal. Since we don’t use a bunch of additives to this like you’d find in the “always sauce” versions of caramel sauce, it will happen. Never fear! A quick appointment in the microwave will easily solve this problem. When using this sauce, we recommend letting it cool slightly, then drizzling over whatever you are using it on. If you use it with cookies, it is nice to have the sauce cool and harden on the cookie. As a result, the taste is still there when hard, but the sauce won’t run everywhere. Finally, give this keto caramel sauce a try. If you’ve made our Four Ingredient Keto Butterscotch Candy, the process and taste are very similar. Because of the heavy cream in this recipe, we can more easily consider it a sauce instead of a candy. Go ahead. Give it a shot. We promise it’ll be good. After a short time, the sweetener will begin to melt and turn into a brown liquid; stir constantly! Be very careful not to heat this too much or it will burn and ruin!